We spend most of our lives in buildings. Our lives also shape the buildings we live in: it is a conversation. Buildings are containers, objects we make to house things and people. They provide shelter and protection against the elements; shade on a hot day, warmth in the depths of winter, dryness in rain. There is one building with rooms that do not house anything physical; it holds the loss of a culture, the shame of a nation. It is fragmented, almost impenetrable: one of the jewels of the Deconstructivist movement. 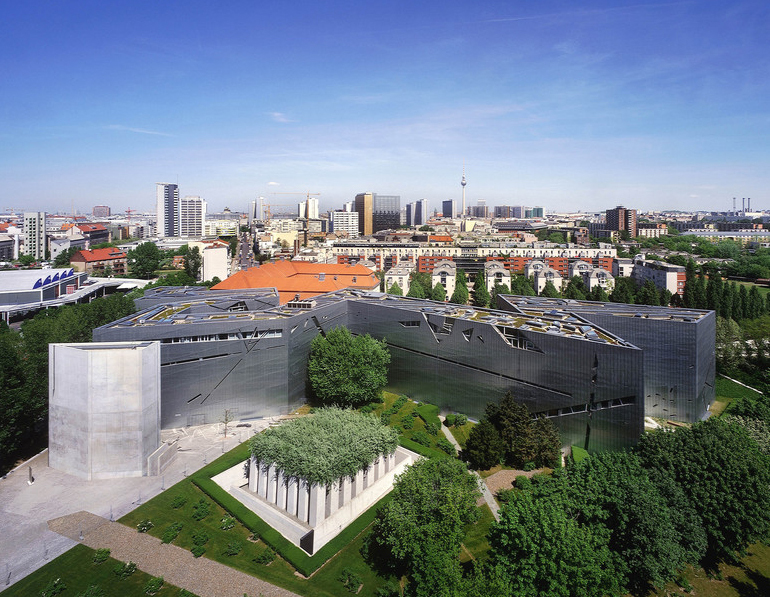 I am talking about The Libeskind Berlin Jewish Museum. Adorno said that poetry after Auschwitz was barbaric. I wonder what he would have made of Libeskind’s Jewish Museum. It is after all, a poem disguised as a building. Museums exist as testaments and memorials to past cultures, to ways of life that have long since passed into the depths of history. They exist in order to exhibit, to display. Libeskind solved a problem when he designed the new building in Berlin, sitting alongside the original Kollegienhaus: he managed to display the un-displayable, to create a building which pointed to absence, to loss, to that which no building could ever contain. Libeskind’s Jewish Museum is a building of stark, uneven edges, uninviting and alienating. If one word could do justice to the emotional and spiritual impact of the architecture upon all who enter, that word would be ‘void’. There is a “Gallery of the missing” in which no images are displayed. Minimal lighting reveals blank white walls and black obelisk-like partitions rise up seemingly at random throughout the floor, hindering progress. One is lead through the museum only to have their way frustrated by dead ends and obstacles. A short staircase leads to a blank white wall and large, imposing concrete pillars form corridors in The Garden of Exile: a cube that leads to nowhere. It is only upon looking upwards that one can see the canopies of trees, like a mirage in a barren and lifeless human-made desert. Then there is the Memory Void, an opening with natural light spilling down from above. The jagged corridor cuts right through the main building of the museum, tearing abruptly through its centre: a gaping, nonsensical hole, interrupting the flow of passage. It is the only voided area which visitors are allowed to enter and it is the section of the museum that has left the most significant impact on all the people I have interviewed. Visitors walk on the installation lining the Memory Void—an artwork by artist Menashe Kadishman titled Shalekhet ‘Fallen leaves’—10,000 small faces punched out of steel. The acoustics of the open area are such that the clanging of the metal faces made by the visitors’ footsteps is almost unbearable. An acoustician friend of mine has said that the sound was unlike anything he had ever head. It was a sound that communicated an uncommunicable sense of horror. It is often forgotten that buildings have sounds: rooms have hums, enclosed spaces their own acoustics: echoes define the boundaries of a space just as much as light and shadow. Light, shadow and sound—those phenomena that are so often the foundational inspiration of much poetry—are malleable tools in Libeskind’s hands. In the Berlin Jewish Museum, we have a marvel of architecture: a building that does not display so much as communicate. All those who spend time in the stark, concrete building come away profoundly moved by a loss that cannot be quantified or communicated. Libeskind’s Berlin Jewish Museum is a magnificent accomplishment of Deconstructivist architecture. More importantly, it is a fitting and lasting testament to a depthless hole in the history of humanity. Contact us today, we would love to collaborate with you to create a truly poetic building!